Ithaca, N.Y.—When male animals compete over mates, it’s often a showy affair: think of elk tangling antlers or tom turkeys strutting and gobbling. But for a Costa Rican hummingbird, it seems mental prowess holds the edge over mere physical flamboyance. New experiments show that dominant male Long-billed Hermits have better spatial memories and sing more consistent songs than less successful males, according to research published this month in the journal Scientific Reports. The benefit of a good spatial memory even outweighs the advantages of bigger body size and extra flight power. Studies like this one make us think about what it means to be "intelligent." Photo of a Long-billed Hermit by Chris Jiménez. The Long-billed Hermit is common in the rainforests of Costa Rica. It’s about twice the size of the familiar Ruby-throated Hummingbird, with a long, curved bill just right for sipping nectar from brilliant-orange heliconia flowers. Males perch in the forest understory and sing incessantly, every day during their 8-month breeding season, at display sites known as leks. The dominant males fight over coveted singing perches, sometimes stabbing at each other with specially sharpened bill tips. Less dominant males, known as “floaters,” come and go from the lek but aren’t able to defend a singing perch. Displaying males risk losing their spot each time they leave to refuel, so there’s a premium on getting to nectar-rich flowers quickly. But feeding trips are like a giant game of concentration, with each bird often flying for a mile and having to choose among thousands of blooms to get their fill. 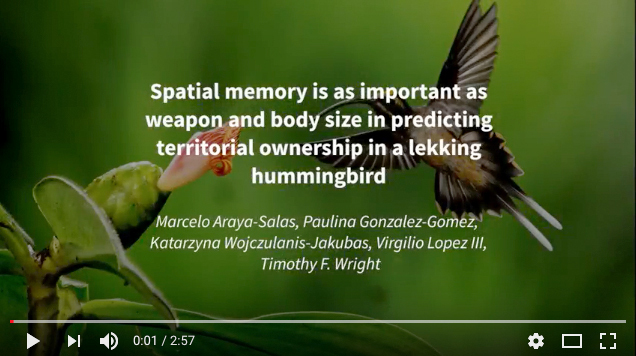 This short video shows how the hummingbirds display and fight, as well as how they performed during the spatial memory research. Video by Marcelo Araya-Salas. Araya-Salas and his colleagues devised a simple experiment to test how well males could remember reliable food sources. They set up a row of three hummingbird feeders near the leks. Two contained only water; one had sugar water. The researchers watched the birds make a first trip and discover which feeder held the goods. Then they waited until the birds came back and recorded whether they found the sugar water on their first try. In all, they tested 30 male hermits from 3 leks, with most of the males completing at least 10 trials. Birds that showed better spatial memories were consistently more likely to be dominant birds with perches at the lek, while the floaters were the ones that couldn’t remember which feeder was which. The pattern was independent of age, so it wasn’t just that older males had both better memories and more dominant positions. Even more surprising, better memories won out over physique: birds with bigger bodies, or a larger, sharper bill point, or that could fly with more power (as measured by their ability to briefly lift a small weight), still couldn’t win space at the lek as well as the males with good memories. Araya-Salas says the spatial memory could help in two ways—by making foraging trips faster, or by helping the males keep track of where their rivals sat within the lek, making it easier to defend against them. The researchers also noted that males with better spatial memory also sang more consistent songs. It’s thought this ability is attractive to females, because it means the singer sounds less like an inexperienced youngster and more like a veteran survivor. It remains to be seen how well the spatial memory task translates to the much more complicated task of finding rewarding flowers in the real-life rainforest, as well as what specific mental tasks the dominant hummingbirds are excelling at. Araya-Salas says it’s still hard to compare Long-billed Hermits against the bird world’s most famous memory artists, birds like the Pinyon Jay and Clark’s Nutcracker, because the tasks—remembering flower locations from day to day vs. stashing seeds in the ground for months—are so different. But the exciting thing, he says, is the recognition that cognitive abilities are so important. The research was supported by the National Geographic Society, New Mexico State University, the Organization for Tropical Studies, and the British Ornithologists' Union. In addition to Araya-Salas, the research team consisted of Patricia Gonzalez-Gomez of the University of California, Davis; Katarzyna Wojczulanis-Jakubas of the University of Gdansk, Poland; Virgilio López III of the University of Connecticut; and Timothy F. Wright of New Mexico State University. The following images may be used in stories about this research, and the video may be embedded in online stories. Images must be credited to Chris Jiménez and, for online stories, linked to http://www.chrisjimenez.net. Long-billed Hermit hovering. 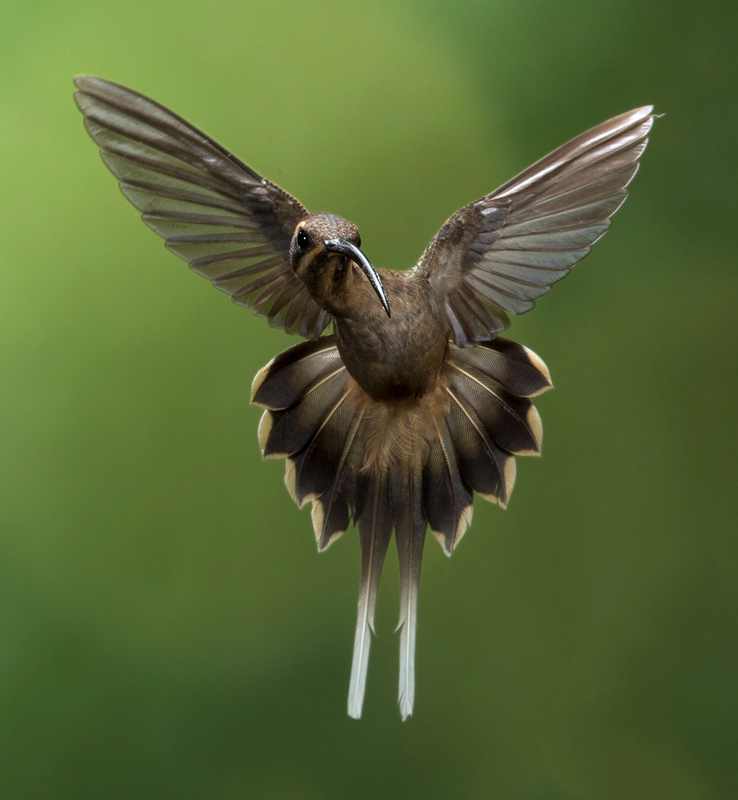 A Long-billed Hermit displays its long tail feathers and long, curved bill. Photo taken in Braulio Carrillo National Park, Costa Rica, by Chris Jiménez. Download uncropped, full-resolution version. Long-billed Hermit feeding (top image). A Long-billed Hermit feeds at one of thousands of flowers in the understory of the rainforest in Braulio Carrillo National Park, Costa Rica. Photo by Chris Jiménez. Download uncropped, full-resolution version. Explainer video showing aspects of research. Embed from YouTube. The Cornell Lab of Ornithology is a nonprofit membership institution interpreting and conserving the earth’s biological diversity through research, education, and citizen science focused on birds. Visit the Cornell Lab’s website at www.birds.cornell.edu.